With WPBakery Page Builder you instantly have access to 50+ built-in content elements available out of the box. Each of content element has been carefully crafted by web design professionals and offers multiple options which are enough to build any layout you can think of. Literally, within minutes you can build complex layouts on the basis of our content elements and without touching a single line of code. And if you think that it’s not enough you should check WPBakery Page Builder add-ons to discover 250+ add-ons with hundreds of content elements available. All you have to do is just drag the element into your page or post and you are ready to launch your WordPress website. WPBakery Page Builder offers all the controls you need to work with content elements – add, edit, duplicate, remove or create presets for your elements whenever you wish with just single click. And with the smart Role Manager that is included in our page builder, you can control access and options available to different user roles within your WordPress site. 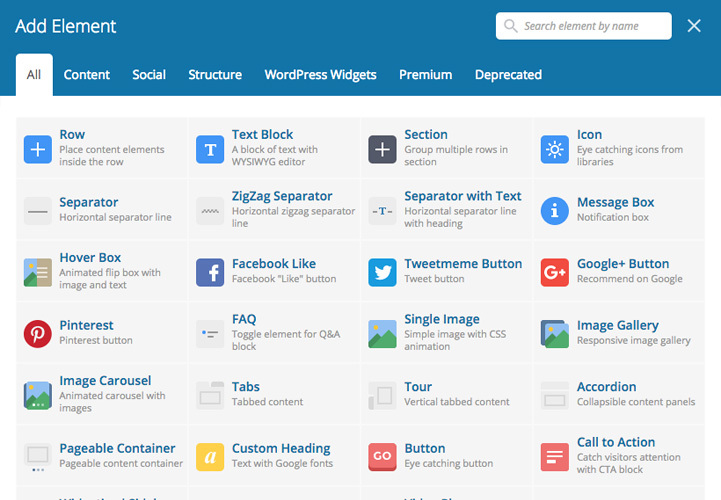 Control your WordPress site layout like never before. And that’s not all – if you don’t want to build your WordPress website from scratch you can always use our predefined templates. 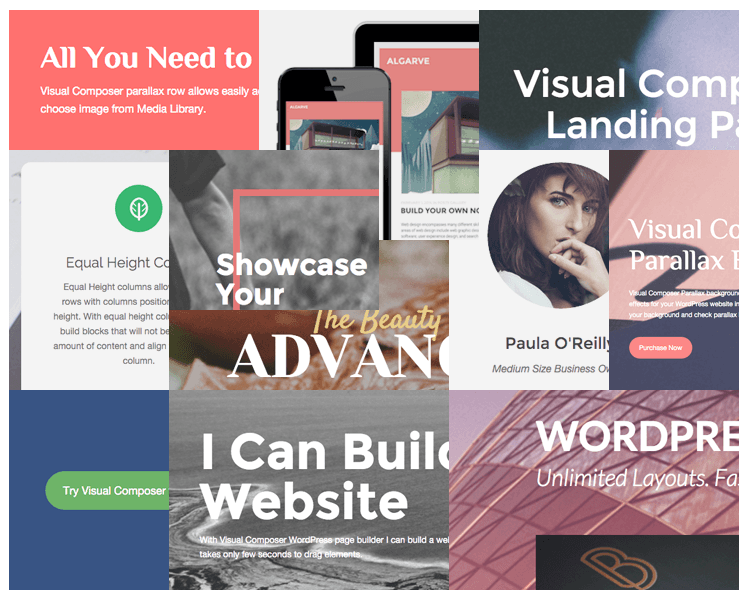 There are 100+ pro looking templates covering all the website sections you may need. Use predefined templates or create your own templates to reuse content and save even more time. WordPress comes with great widgets that we all love, so when you will need them – they are there ready to serve. All of them! Check our WPBakery Page Builder addons section or consider creating a new add-on for WPBakery Page Builder which you can then sell on CodeCanyon.